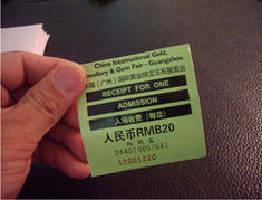 Printable RFID Label targets ticketing applications. With unique ID for tracking and tracing, 125 KHz RFID LF Label is designed for access control at ticketed events. Attached to clothes or anywhere on body, label enables customers to repeatedly go in or out of event without manual records, curbing counterfeiting and optimizing security. Available in different colors and printable with barcode and serial number, label can be customized with 1, 2, or 4 K memory for data storage. DAILY RFID has introduced its latest 125KHz RFID label designed to be used as tickets in trade fair and airport, etc. This printable 125KHz LF label is used to access control for ticketed events to cut down the cost of RFID system, while improving the customer experience. Unlike the traditional paper ticket, this 125KHz RFID label can curb counterfeiting and increase the security. Not only because it is durable and easy-to-use, but also because each LF label has a unique ID for tracking and tracing. With this smart 125KHz RFID label attached to clothes or anywhere on body, customers can repeatedly get in or out of the trade fair without doing any manual records. Thus, it helps to curb counterfeiting and improve efficiency, reduce labor costs as well. And the memory of the 125KHz LF labels can be customized in 1K, 2K or 4K for data storage. Besides, it is available in different colors and printable with barcode and serial number to serve customers' actual request. In addition to ticket usage, this smart label is originally white blank and could be designed flexibly for a wide range of applications, such as distribution industry, library, inventory, container identification, security, parking card, fashion, medical service that requires packaging and labeling. Please visit www.rfid-in-china.com/products_686_1.html for more information about the RFID labels. For sales inquiries please contact: 86-15817191372. DAILY RFID CO., LIMITED ( www.rfid-in-china.com ), a subsidiary of PAN Group Co., ltd, is the leading company focusing on the RFID LF/HF/UHF/ readers, tags in China. Also, we own a factory covering an area of 26,000 square meters.